A mother-of-two opened up her home to a grown man posing as an Afghan '12-year-old refugee' who later attacked her family. The woman said she lives in fear after the man, who said his name was Abdul, threatened to kill her family after he was arrested for assaulting her relatives. 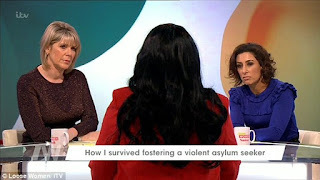 During an emotional interview on ITV's Loose Women, the mother, who was renamed Julie for anonymity reasons, has now called on the Government to carry out proper age checks on refugees coming to the UK. She told presenters Ruth Langsford and Saira Khan that she had taken in the asylum seeker after being asked to look after him for a 'few nights' by social services. Julie recalled: 'When I walked into the room, I didn’t think he was the person they were referring to. He looked about 19. He was very quiet and very timid. Despite her initial misgivings regarding the boy's age, Julie generously opened up her home up to the youngster. However, she became suspicious of his true identity after a dental examination. She said: ‘We went to a dental appointment and the dentist age-assessed him between 18 and 21. Julie said that at first her new arrival was pleasant and well behaved, but soon he turned nasty. She later found out he was not the person he said he was and had been arrested while posing as a child refugee in Belgium. She said: ‘He was lovely in the beginning. Very humble, very polite, very thoughtful. But as the weeks went by I started to notice a change in him. I was comparing him to my boy and he was more mature than my boy was. 'He had been arrested in Belgium. He had a bone density x-ray there and they said '‘you aren’t 12’' and sent him on his way. ‘I became very frightened, he became quite menacing after I set up a Facebook account for him. Julie said she felt scared to be alone with Abdul in her own home but didn't want another family placed with such a temperamental and possibly dangerous man. She said: ‘I was concerned because if they asked to re-home him, I didn’t want him to go to another family because he wasn’t who he claimed to be. ‘I can remember one day he went up to the fridge and he was looking at a photo of me and my daughter, as if he was trying to intimidate me through my daughter. 'My daughter was stood there and I can remember thinking, '‘don’t turn around’'. I knew and I could see what he was doing in the corner of my eye, but I kept on wiping up. about tricking the British government into thinking he was a child. A permanent home was found for Abdul and it was then that he started to lash out at Julie and her family. She said: 'There were other homes that had been offered to him and it wasn’t where he wanted to go. 'When another home came up he became very aggressive about it. ‘He started [attacking] verbally and then a member of my family got in between us, in fear of me getting hurt, and then he pushed them back and started punching. 'I ran to get the police and I was just pleading with him to calm down and just said ''why are you doing this?''. ‘I’m very frightened since he was removed. I know that he’s not being properly watched and he could at any time, turn up at my house. I panic if I’m not at school on time. Julie has called for Theresa May to enforce greater scrutiny on the refugees who are being taken in by British families. She said: 'It’s not that I want to put people off looking after any refugee or asylum seeker, it’s just that proper checks need to be done. ‘They are guessing these men’s ages and placing them in the homes of other vulnerable children. 'To Theresa May and the Government I would like to say, if you are insisting on allowing these men to come here then make sure you give proper age assessment checks, like in Belgium.